The Bible divides the entire human race into two classes; the righteous who rejoice before God (Psalm 68:3) and the wicked, with whom God is angry every day (Psalm 7:11). The righteous are those who have true faith in Christ, and who have been renewed by the Holy Spirit. Their original selfishness and stubbornness is subdued and slain, and they live a new life through the ever present grace of Christ Jesus. Every sinner has the opportunity to experience God’s grace while he is alive; but needs to understand that in hell there is no grace. Man will be without any excuse at the final judgment and there will be no escape from the omniscient, omnipresent, almighty God. Jesus said, “You snakes! You brood of vipers! How will you escape being condemned to hell?” (Matthew 23:33). Neither atheists, pagans, false Christians or unbelieving Jews can escape God’s final, eternal judgment. Paul writes, “Or do you show contempt for the riches of His kindness, tolerance and patience, not realizing that God’s kindness leads you to repentance?” (Romans 2:4). All sinners experience God’s abundant goodness, forbearance, and longsuffering. In other words, God created us and provides for our every need; He does not leave us when we sin; and He is longsuffering toward us. He does not punish us instantly for our sins but waits patiently to see whether we will repent and think differently about Him, before it is finally too late. He waits to see whether we will forsake all our sins and turn to serve Him with all our mind, heart and soul. We need to understand that the purpose of God’s grace is to lead us to repentance. God could have judged us long ago, instead, He shows the abundance of His kindness; yet many are willfully ignorant of the purpose of God’s goodness, are stubborn and refuse to repent. Peter tells us that God is patient with us, “not wanting anyone to perish, but everyone to come to repentance” (2 Peter 3:9). Sadly, the majority of people today abuse the goodness, patience, and longsuffering of God by stubbornly refusing to respond to God and making their hearts more hardened and unrepentant. Engaging in ever-increasing sin, they become more violent, wicked, and filthy, thus storing up for themselves God’s wrath as they live a sinful life, damned for an eternity in the Lake of Fire. God’s judgment is a righteous judgment. 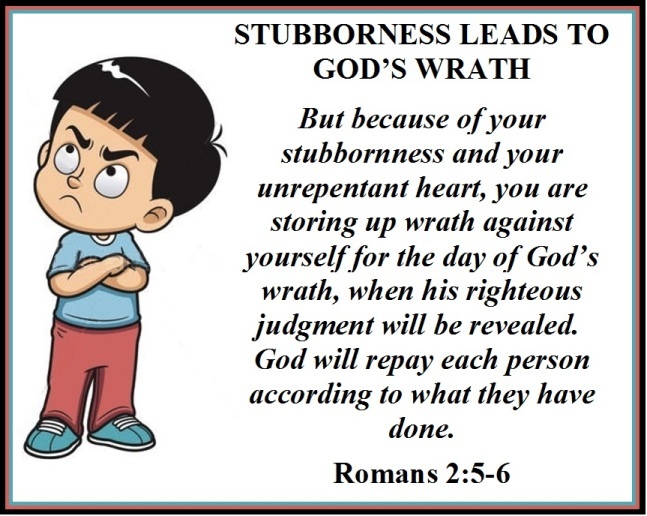 “But because of your stubbornness and your unrepentant heart, you are storing up wrath against yourself for the day of God’s wrath, when his righteous judgment will be revealed” (Romans 2:5), and all unbelievers must look forward to such judgment. “God ‘will give to each person according to what he has done’” (Romans 2:6). Every individual who ever lived shall be judged for what he has done while in the body. Every man, being God’s creation, is to obey God and worship Him only, and he will be judged for his actions. Did he conform to the truth of God, or exchanged the truth for a lie? Did he suppress the truth to practice wickedness? Paul is saying that each of us will be judged for what we have done. Then he writes, “There will be trouble and distress for every human being who does evil” (Romans 2:9). Either we produce good works, evidencing our justification by faith, or we produce dead works, demonstrating our unbelief, stubbornness, un-repentance, and enmity against God. Those who are saved by grace through faith are to produce good works: “We are God’s workmanship, created in Christ Jesus to do good works, which God prepared in advance for us to do” (Ephesians 2:10). Good works are God’s works; it is the fruit produced due to our vital union with Christ the vine. If we produce no fruit of obedience, we have no vital connection with Christ. It is true that we are not saved by works, but by faith alone; however, saving faith will always conform in obedience to God. Paul writes, “Jesus Christ, gave Himself for us to redeem us from all wickedness and to purify for Himself a people that are His very own, eager to do what is good” (Titus 2:14); therefore, for a Christian, doing good works is a delightful and natural thing to do. So what is the final verdict of God’s judgment? Paul writes, “God ‘will give to each person according to what he has done.’ To those who by persistence in doing good, He will give eternal life, “but for those who are stubborn and who reject the truth and follow evil, there will be wrath and anger. There will be trouble and distress for every human being who does evil” (Romans 2:6-9). What can we do in the light of this sober truth of the final and eternal judgment? First, we must realize that those who have already died can do nothing. Their destiny has been sealed (Hebrews 9:27); but for those who are still living, there is great hope. Repent and believe on the Lord Jesus, and you shall be saved. Jesus is the Judge, but He is also the only Savior of the world. The cross reveals God’s justice and wrath, but it also reveals His great love: “There is now therefore no condemnation for those who are in Christ Jesus” (Romans 8:1). No man can escape the Judge or the judgment, therefore, seek Christ and eternal life, and seek peace with God through repentance and faith. There are only two kinds of peoples, believers and unbelievers; only two ways, the broad and the narrow; and only two destinies, eternal life and eternal death.